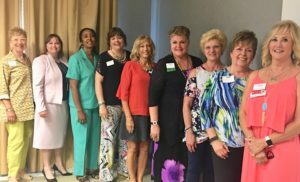 I was thrilled to be able to speak to this dynamic group of women in August 2018. Sharing “What’s In Your Networking Toolbox” is a fun and lively presentation with lots of ‘audience participation’ !!! Even at 9am on a Saturday morning, these ladies were fired up and ready to Connect with each other. Networking is a wonderful opportunity to meet ladies from all Chapters in the Kansas City area and I was THRILLED to see so many familiar faces. I am a member of the Board of the KC Express Network, we meet on the 3rd Tuesday of each month at Hallbrook Country Club, and there were SO MANY of our members available to attend this morning meeting. If you would like to attend our monthly Networking Luncheon, please connect with me or visit the website, www.ABWA.org and look for the KC Express Network for details. American Business Women’s Association may be just the organization you’ve been looking for.